Boy it's been a while since I last posted something of substance (not to mention nursing related) on my blog. As always I have been unproductive in my student life, doing things other than studying (like blogging). Anyway, I guess it's better than being out in the streets late at night partying right (defensive mechanism: rationalization; I'm actually just a lazy bum)? So on with my post... I've recently applied for a position as a psychiatric aide in a geriatric mental health facility where I formerly worked as a dietary aide. I'm pretty happy to have taken the position as it is pretty hard to get a job in the health care field with out the proper education (I'm still a 2nd year nursing student). Many people would ask why I decided to work in a mental health facility in the first place. People think that people with mental illness are dangerous. Well ladies and gentlemen, that is a MYTH. You will find more aggressive people at retail stores than a mental health facility. The problem with mental health is that it is surrounded by stigma. Stigma is defined as an occurrence of labeling, stereotyping, isolation, discrimination, and status loss (Björkman, Angelman, & Jönsson, 2008, p. 170). Mental illness is just like any other disease: it is treatable; yet so many people treat people with mental illness badly and shun them away. It is said that people with mental illness already suffer the disabling symptoms of the mental illness, plus they have to suffer the social isolation from it. 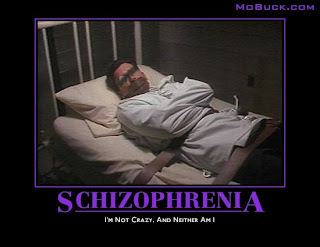 Some people with mental illness would rather suffer in silence from voices in their head or depression just because they fear of being labeled as crazy, wacko, nut job, and other derogatory, hate-laden labels. I have worked with people with mental illness and I could tell you right now that they are the most sweetest people and I enjoy being with them every single day. You have to understand that they're talking to themselves or are not making any sense because there is something wrong with the neurotransmitters in their brain. 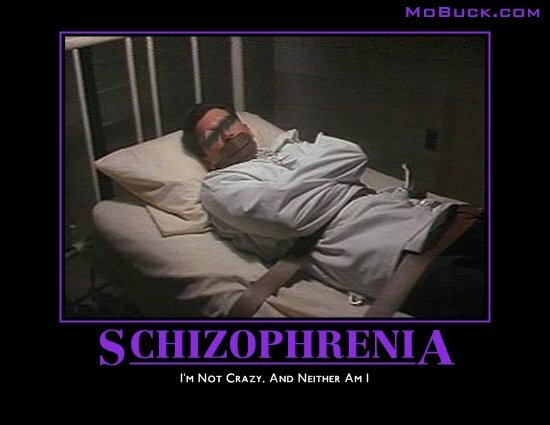 Media has portrayed people with schizophrenia as dangerous just like the picture above. In reality, people with schizophrenia are more likely to hurt themselves than anyone else. They are not dangerous and they don't have a multiple personality as the picture erroneously portray. Understanding what mental illness is and educating people about it is important to reduce stigma. Mental illness is very common and you may not know that your close friend has it, yet he still seems normal. Mental illness is just like having hypertension. We should never treat them differently. I have written a paper about stigma and I was surprised that some nurses who work in somatic care carry more negative attitudes and beliefs against people with mental health and they believe that people with mental illness are intrinsically bad and that they are causing their own problem. People with mental illness come to the emergency room to seek help but they are just dismissed by nurses since these nurses think that depression is just a matter of "will power". Like other physical disorders, mental illness should be treated and these patients should be referred to the appropriate mental health professionals. Did you know that there is great difficulty getting access to mental health services? Your problems are not taken seriously until you prove that you are a danger to yourself or to others? How on earth will you prove that? Well I guess you have to wait until your disease progresses and you do something against your own will. There are several problems in mental health care right now. First is of course the stigma that comes with mental illness, second is difficult access to services, and thirdly we even lack funding and professionals in mental health because of stigma. I hope for a day when stigma will be totally eradicated and that people with mental illness will gain access to the treatment and support (even their own family will disown people with mental illness) that they need. Mental health is interesting, I might be a mental health practitioner someday... who knows.